A crazy thing happened in Fort Collins, and I now own two recumbent bicycles: a HP Velotechnik Street Machine Gte, which is short, and a Rans Stratus XP, which is quite long indeed. I got the Street Machine last weekend, purchased at my “local” recumbent bicycle shop that’s 50 or so miles away in Fort Collins: Spring Creek Recumbents. While recumbent bicycles are not exactly unknown or unseen in the bicycling mecca of Boulder, there isn’t a single bike shop that sells recumbents. I don’t know why. In fact, Spring Creek seems to be the only serious recumbent bike shop anywhere in Colorado. [Edit: Spring Creek was sold to new owners, who renamed the shop Rocky Mountain Recumbents. Same great shop and selection.] I’m just glad they’re in relatively easy driving range. They’re also very knowledgeable and friendly. They have dozens of models of recumbents and even quite a few trikes. And they have quite a few that you can rent by the hour, so you can try some of the models out for extended periods before making any buying decisions. Anyway, twice before this spring I went up to Fort Collins to test ride some of the various SWB recumbents they had. I confess I was lusting in my heart for a SWB bike. Don’t get me wrong. I love my Rans Stratus XP. I’ve ridden quite a few miles on that bike, considering that it’s been largely winter since I bought it. But I wanted something shorter. Lighter. Easier to maneuver when not riding (e.g., when parking it at the office). So now that I’ve done a bit of riding on the Street Machine (which yes is a pretty dorky name – what you may or may not expect from a German company), I can say that it is definitely quite different from the Rans. No surprises there. For example, the riding position on the Street Machine is a bit more compressed than on the Rans, which has me working different muscles, which I figure is a good thing. The Rans is really more like sitting in an easy chair with pedals. The Street Machine is much more of a sport machine. What did surprise me was that the biggest adjustment for me would not be the higher bottom bracket, which has me pedaling much higher off the ground, or the under-the-seat steering (more on that below), but rather the short wheelbase with the small front wheel. Every time I hit a deep dip, such as the rain gutters that cross the street in a nearby neighborhood, I get this feeling that I might actually endo on this thing! The feeling is exacerbated by the front fork shock absorbers, which bear the brunt of the shock but leave the front end of the bike dipping a bit further than I’m so far comfortable with. I trust the engineering, so I figure I just need to get a bit more accustomed to this feeling, but it was something of a surprise. One feature I love, though, is the under-the-seat steering. This tends to bring the front wheel back up under the rider a bit more than more “conventional” SWB bents like the Bacchetta Giro, but I liked being able to relax my arms while steering. And, I confess, the pivot joint at the head stem of the handlebars typical in the SWB made me very uncomfortable. Spring Creek had configured the bike with the mesh seat, which appealed to me as well. The final decider for me on the HP Velotechnik vs. the Bacchetta Giro, which was my other leader, was the full suspension. It really makes a difference on the regular bumps and seams you get on streets and bike paths. I’ll just have to get used to the feeling on the bigger dips … and avoid them when I can. I ride an HP Velotechnik Street Machine Gte… (ooooh, sounds cool). It is cool. 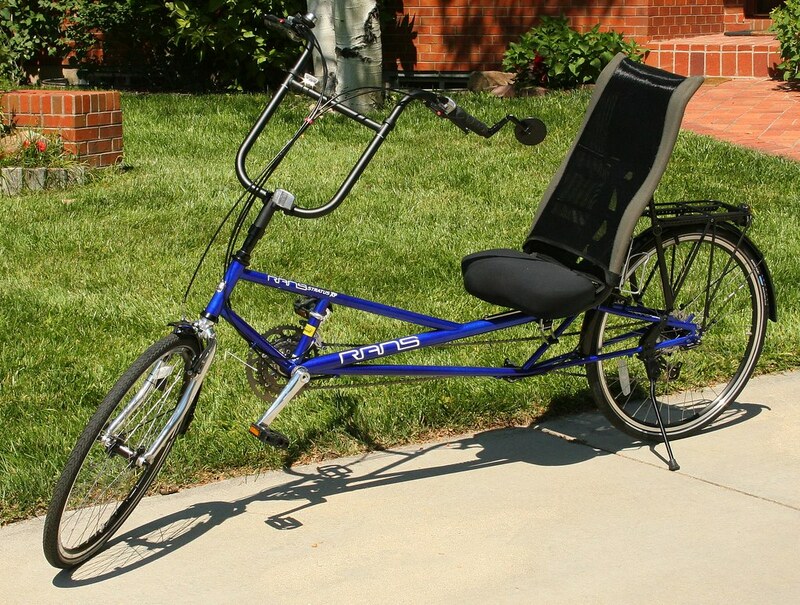 It’s a short wheel base recumbent with full suspension and rides like a lazyboy on rockets. It’s as fast as a bike that is this comfortable can be. And it’s a mule in that it can carry a ton of crap… and I do. I’m going to be using the Street Machine as a commuter bike, and the Rans Stratus XP for longer rides. At least that’s what I’ve been thinking. But the HP Velotechnik Street Machine Gte is billed as the ultimate touring bike, so maybe I’ll be changing my mind in the coming months.